Budget Accommodation at Four Star Backpackers Hostel in Hermanus. 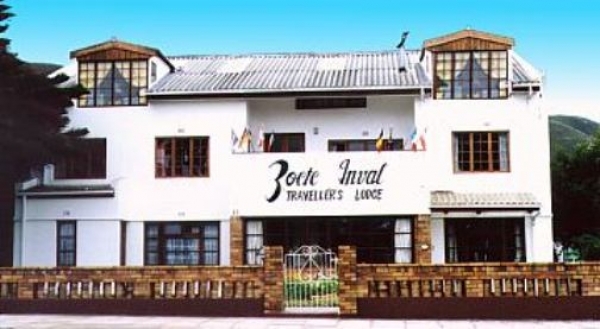 Accommodation at Zoete Inval Travellers Lodge is perfect if you're backpacking in South Africa, looking for budget accommodation for your family holiday or simply looking for comfortable but cheap accommodation to fit in with your travel budget. A Choice of Accommodation for Travelers. The Guesthouse offers 7 comfortably appointed rooms on two floors: doubles, twins or family suite (with ensuite or shared facitlities). These rooms are served by balconies, spacious TV lounge, mini kitchen, and fireside library / lounge area. Rooms 1 & 2 are located on the ground floor and wheelchair accessible. On the same level are the fireside library and the breakfast room. The Backpacker\'s Loft provides hostel accommodation: 8 bed dormitory, 5 bed dormitory, double or family suite. These rooms are served by a TV lounge, mini kitchen and ablution facilities. Rates from: R100 to R150 per person sharing.